Arrangements for Jazz Quintet, pdf format. You are here on the right page to find saxophone, string or clarinet quintet arrangements in all Jazz styles and listed by levels difficulty. In our list there is a Jazz classic by Herbie Hancock, Watermelon man, for sax quintet: ss, as, ts, ts, bs. All the music sheet are arranged by our-selves. The arrangements can be downloaded at pdf format, to view them, download the Abobe Acrobat Reader. 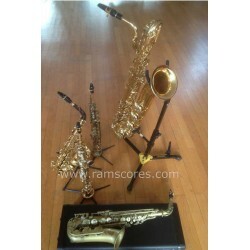 You could also enjoy our choice of Arrangements for saxophones duet or saxophones trio or saxophones quartet.